Put that reminder in your phone now. Add it to your iCal, your Google Cal, or grab a Sharpie and circle “October 9” on your calendar as vibrantly as you can. Because if you aren’t registered to vote in Georgia by that Tuesday, you are not voting in the general election November 6. So how do you register to vote in Georgia? It’s fairly simple. You can register online here through the Secretary of State’s office. To register online, you must have a valid Georgia driver’s license or ID card issued by Georgia DDS. If you don’t have either of these things, you can apply using this mail-in form, which will ask for the last 4 digits of your social security number in lieu of a driver’s license or Georgia ID number. Print and complete the form and mail it; the postage is prepaid. If you don’t own a printer, you can get one of these forms at the county board of registrars’ office, or an election office, libraries, schools, recruitment offices, or if you’re a college student, from your school’s registrar office. 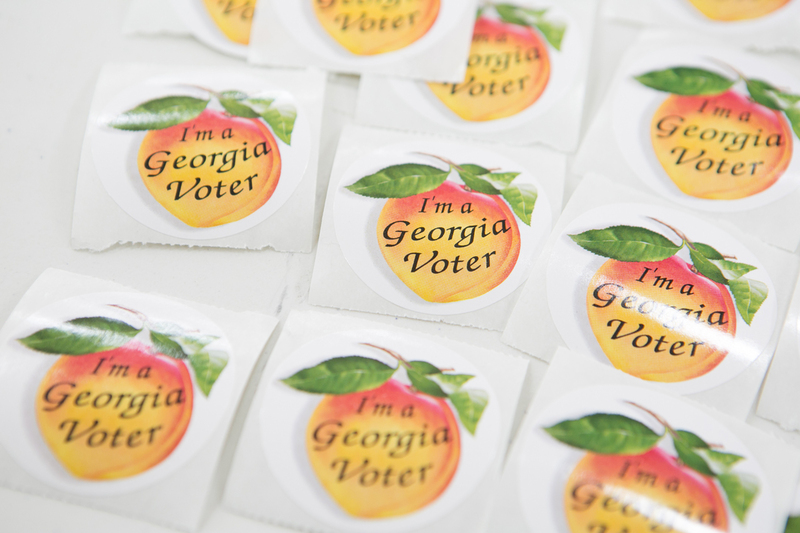 To be eligible to vote in Georgia, you must be a U.S. citizen, a legal resident of whichever county you live in, and at least 18 years old on Election Day (you can register once you hit 17 and a half years old). You also cannot be serving a sentence “for conviction of a felony involving moral turpitude,” and you cannot have been found “mentally incompetent” by a judge. If you are registered to vote or think you are, it’s important to check your voter registration status before October 9. This process takes about ten seconds on the Georgia My Voter Page; just enter your first initial, last name, county, and birth date. If something looks wrong with your registration status, contact your county’s registrar office. Also, since voting is processed at the county level, if you’ve moved across county lines more than 30 days before the election, you must register to vote in your new county. (The city does not matter; if you still live in Atlanta but crossed the Fulton/DeKalb line, you have to register in your new county.) If you don’t, you won’t be able to vote on November 6. If you moved across county lines within 30 days of the election, you are safe to vote in your previous polling place. If you moved within the same county, you should still be registered, but your precinct might have changed. You may be able to vote in your previous polling location if you haven’t notified the registrar of a change of address at least 30 days prior to November 6, but you should let them know you moved. You can either write the county board of registrars’ office or submit a new voter registration application. Once you’re registered, the Georgia My Voter Page has a lot of information you’ll need for election day, including sample ballots and information about your polling place. We’ll have more election information throughout October, so stay tuned.